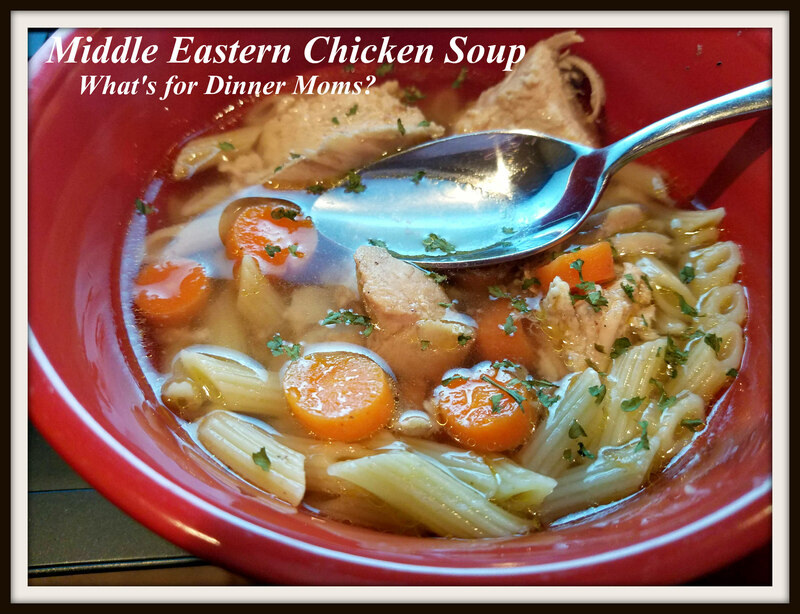 Middle Eastern Chicken Soup – What's for Dinner Moms? We had a bit of an ice storm yesterday afternoon. I went to my car about 2 pm and it was enclosed in a nice coating of ice and the sidewalks and roads were smooth ice. So, I cancelled both of my meetings and we all had a nice night in. I’m so glad my daughter stayed in Kalamazoo last night as the highways were awful. Thankful we have great friends from dance who have offered her a place to stay overnight. Soup and bread were needed for the cold icy night. This is another one of those times I wish you could smell this dish. 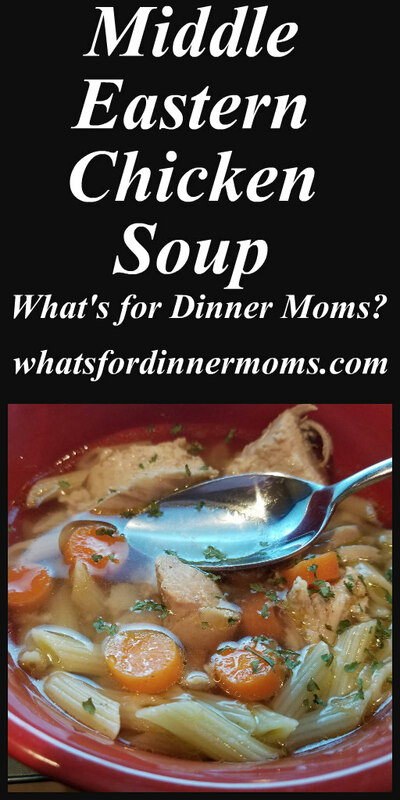 It looks like simple Chicken Noodle Soup but it is so much more than that! The spices raise simple soup to a delicious dish. I wanted something a bit different from normal plain chicken soup when I remembered a soup from a local restaurant that we love. Just the memory of the smell was making my mouth water and I thought I could figure out how to closely replicate it. I used Garam Masala spice in a jar (a mixture of black and white peppercorns, cloves, cinnamon, nutmeg, cardamom, cumin and coriander) for this but you can make your own if you like. I love having this on hand because it adds a delicious Middle Eastern spiciness to many of my dishes. The smell alone is worth making this soup. Every person that came in the house asked what smelled so good! My entire family asked me to make this again. The restaurant we usually go to makes this dish with chicken thighs but the chicken breast kept it from getting too greasy. With the spices we didn’t worry about the chicken flavor so much and we thought it was delicious! An amazingly aromatic chicken soup. Bring chicken, chicken stock, celery, onion, and carrots in large pot over medium-high heat to a boil. Lower heat to simmer and cook until chicken has cooked through about 20 minutes. Remove chicken breast from pan once it has cooked through. Cut chicken into small bite sized pieces and return to pan. Add garam masala to soup. Prepare pasta according to package instructions. Taste soup and adjust spices with salt, black pepper, and garam masala to taste. Serve soup over pasta with a sprinkle of parsley as desired. Sounds good! I like my food on the spicy side. This is more of am umami than spicy. Really aromatic spicy. I love soups at this time of the year. This one looks just perfect for a cold winter day. Thank you! I love the umami type flavor in it. I think I never tasted that flavor before. I showed this recipe to my husband and explained a bit about your blog and how you often devise such creative recipes to use up stuff in your freezer or to recreate something you’ve liked in a restaurant. We have a jar of garam masala that he bought some time ago for a recipe we’ve already forgotten about. He and my daughter thought your soup sounded delicious and are excited to try it. We just spent several hours today digging out of the snowstorm that also hit you across the lake (we’re in Milwaukee), and the weather is about to turn bitterly cold. Your soup sounds like exactly the kind of meal we need! Thank you! We love Milwaukee and spend several weekends a year there dir Irish dance competitions. The thing I really try to encourage people to do is taste your food and make it something you like. If I say 1 teaspoon of garlic and it needs 2 or just a half teaspoon for you change it! Make it your own! I try to offer guidance but want you to love what you cook. Hope you like the soup! This is definitely soup season. The temps are dropping over the next few days and frigid highs are expected for days. When I saw highs below zero for next week I was thinking it is time to hibernate!